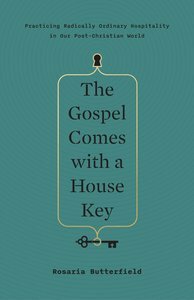 About "The Gospel Comes With a House Key"
Rosaria Champagne Butterfield, a former tenured professor of English and women's studies at Syracuse University, converted to Christ in 1999 in what she describes as a 'train wreck'. He memoir The Secret Thoughts Of An Unlikely Convert chronicles that difficult journey. Rosaria is married to Kent, a Reformed Presbyterian pastor in North Carolina, and is a homeschool mother, author, and speaker.